…… and it’s time to finish them after a decade of storing. 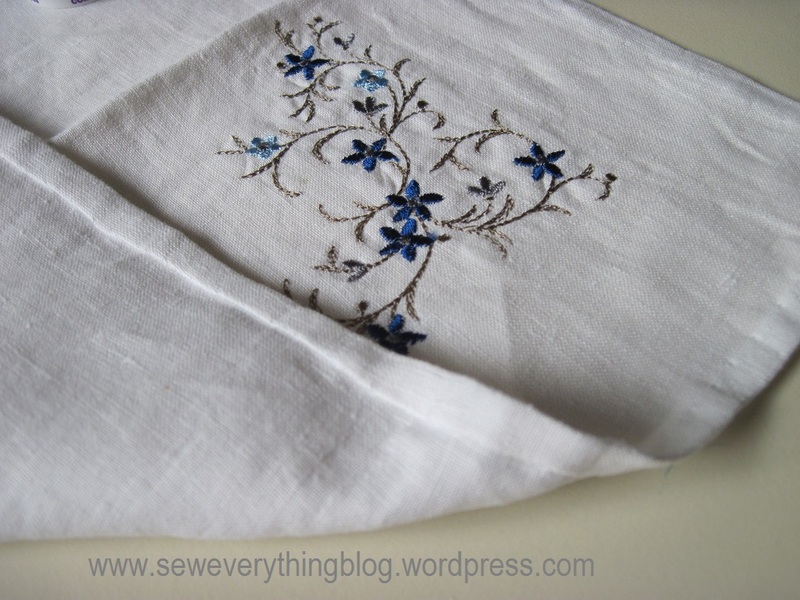 The tasks at hand are hemming the edges of all seven embroidered napkins, and adding embroidery and hemming to the last eighth blank square to complete the set. The napkins are smaller than dinner size and will probably be considered cocktail napkins. Except, I don’t do cocktails. I do high tea, so I’m calling them tea napkins. In case you haven’t noticed, there are four ecru and four white napkins. 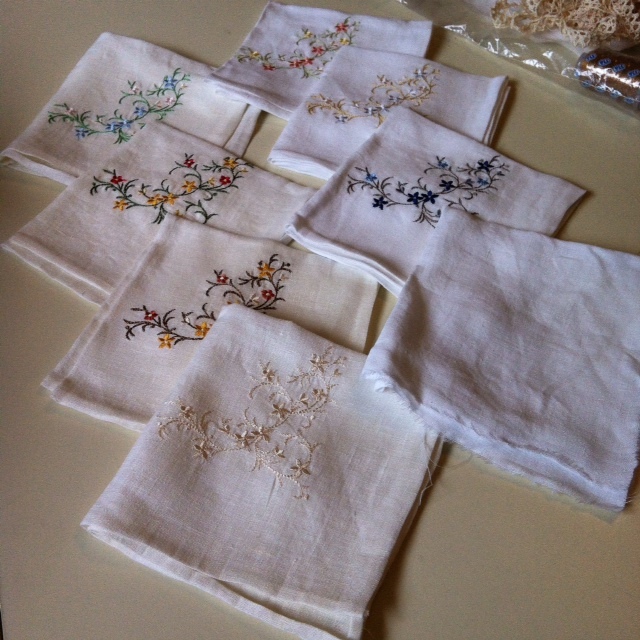 They are made with fine linen, with scraps left over from a couple of much loved and much worn blouses — in the 90s. The napkins have a vintage look but are made with 21st century technology – except for the hand hemming. 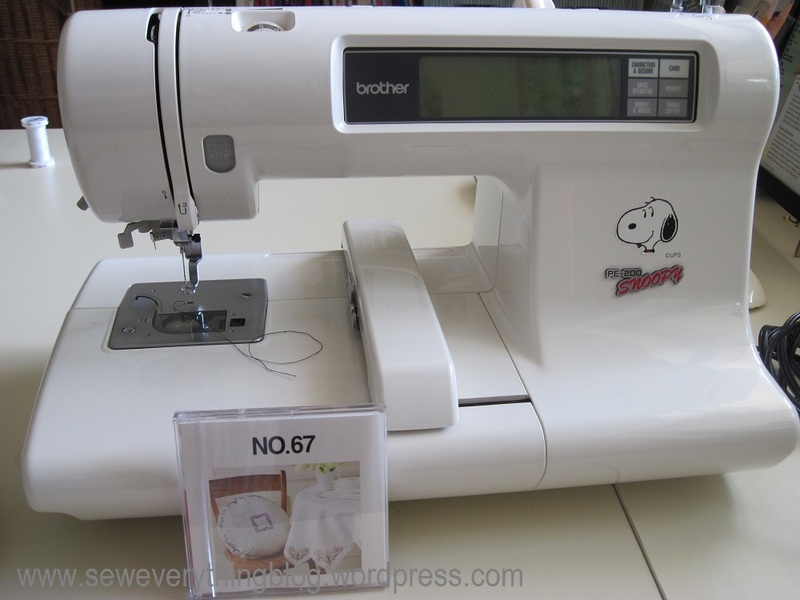 They’re embellished with machine embroidery using a Brother embroidery machine and card #67. Since my old embroidery machine did all the embellishment, I’m going to focus on a hemming technique my fellow students and I learned way back in our clothing lab at college. Invisible Hem: That is what the professors of Clothing and Textiles called it in back in the day. Halfway across the world and decades later, it’s called a “slip stitch”. Whatever the name, this is the technique I use for hand hemming anything. On the inside it is truly invisible, and on the right side you can barely see the stitches. 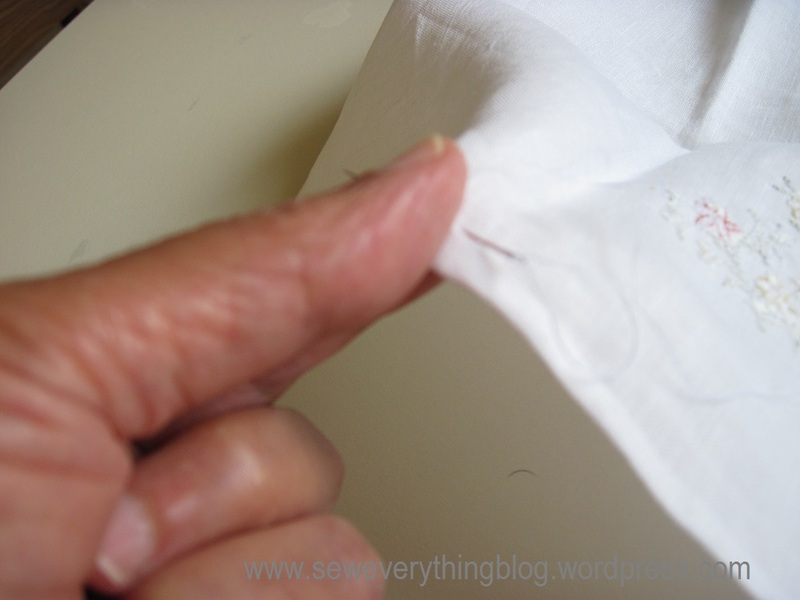 On certain fabrics, if you ply your needle correctly, it’s also invisible on the right side. 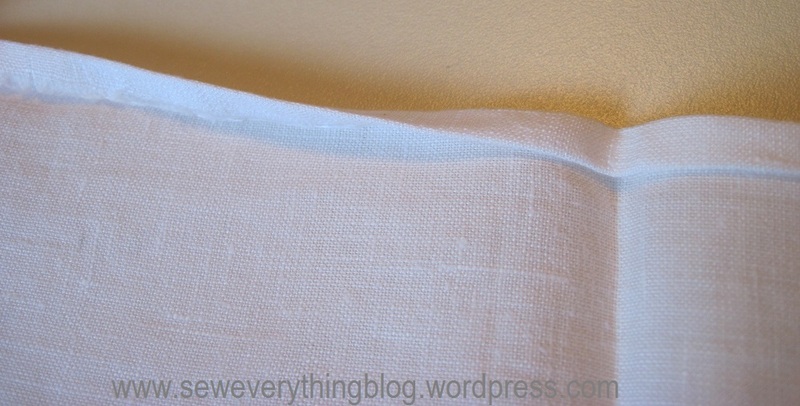 Press all edges of the napkins in a double fold hem by pressing up ¼” then ¼” again. Thread a fine hand sewing needle suitable for lightweight linen. You can wax the thread with beeswax at this point but I did not. Make a small knot at the far end; my professors hated knots but I did not get into the habit of no-knot hand sewing. Working from the wrong side take a small stitch in the body of the napkin by picking up a couple of threads with your needle. 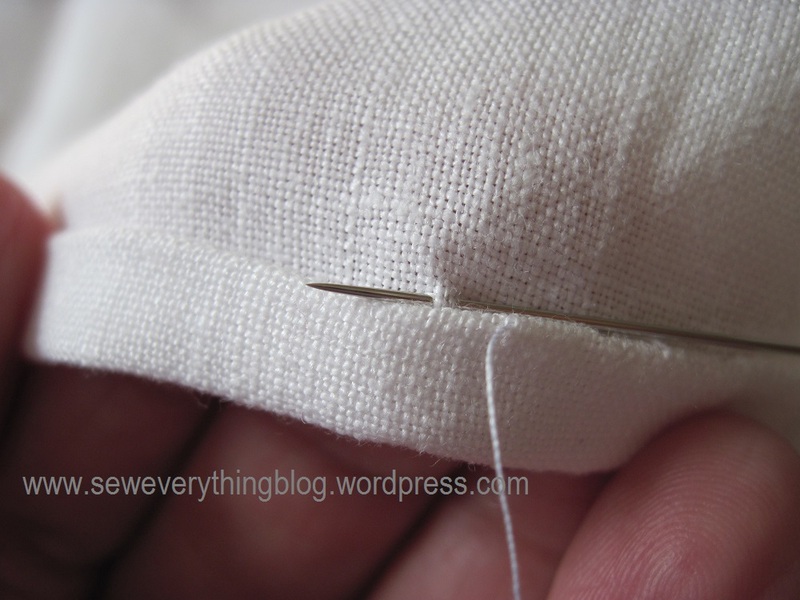 Pierce needle into the upper fold of hem right above the previous stitch and bring it out approximately 3/8 to ½” away. Pull thread all the way so that the stitch is reasonably taut but not loose. It should not be so tight that you can see dimples or puckers on the right side. Here’s how my hemming looks. I like it. 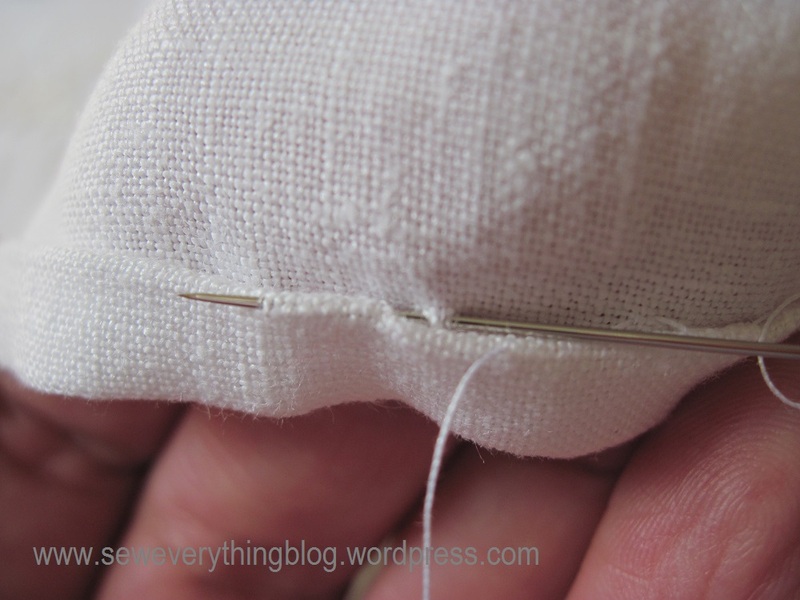 Tip: My favorite hand position while pulling the thread is holding the stitch between my thumb and forefinger of the left hand (the right hand plies the needle). For lefties, reverse this. If I can feel the thread moving, I can control the tension of the stitch. This is also a good way to avoid thread tangles . Keep hemming until all four sides are done. Tip: I kept the napkins visible through the hallway, and took a few stitches as I passed by. As I write this, the ecru napkins still need to be hemmed. Hope you like my invisible hemming ways :). My home is a cloth napkin establishment. We almost never use paper napkins unless necessary, like the time when my guest asked for a paper napkin rather than use the pretty cloth versions. Yes, that really happened. What do you think? Why do some people shy away from a nice clean cloth napkin? We like to use cloth napkins at our house as well. I usually find such nice ones in the thrift stores that I have not made my own yet. Slip stitch is 90% of my handwork. Your napkins are lovely. Thank you! I had quite forgotten about these napkins. I guess out of sight, out of mind. So glad I found them…. Oh, we know why people shy away from always using cloth napkins. It’s the stain removal, laundering, ironing process that follows usage. Some find it relaxing, but I am not in that camp. But Samina, I so admire that you stick to using lovely cloth napkins. That is living life with style and panache! I’m having a teensy panic attack over putting together an informal luncheon tablescape for our county fair because it requires knowledge of etiquette rules that I’ve long ago forgotten! 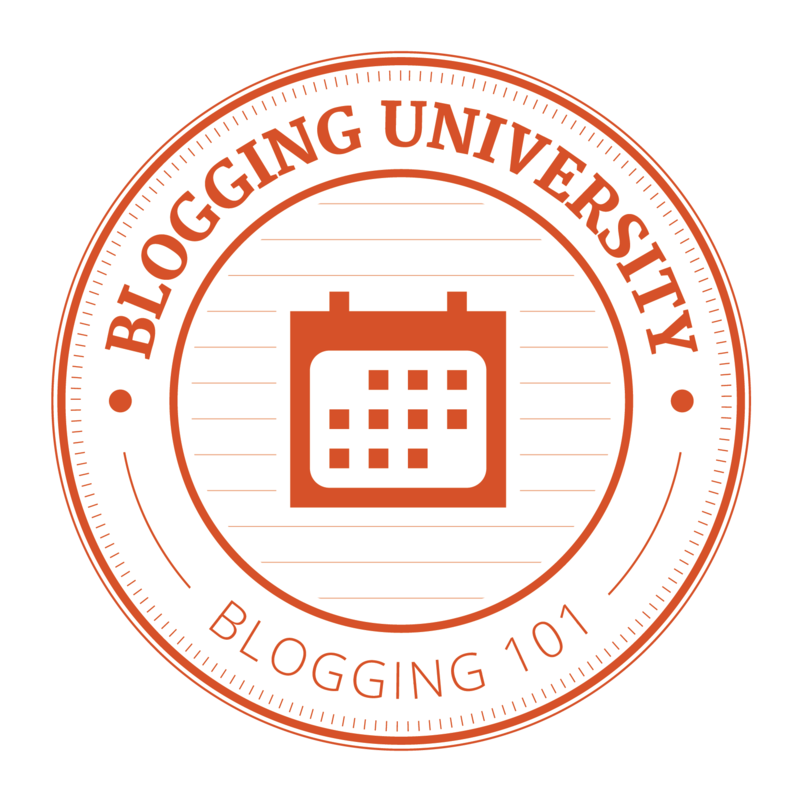 OK, so I am really longing to see your tablescape. Hopefully you will post a picture, if you have not done already. I have been neglecting Facebook these days. Am going there right now. These are so pretty! Such a great idea to repurpose an old blouse. Waste not want not! The napkins are lovely. I enjoy using cloth napkins. I wash often so it is not an issue and another “green” habit. Thanks, Karon! We think alike. They are so delicate and pretty! Glad you are finishing them. 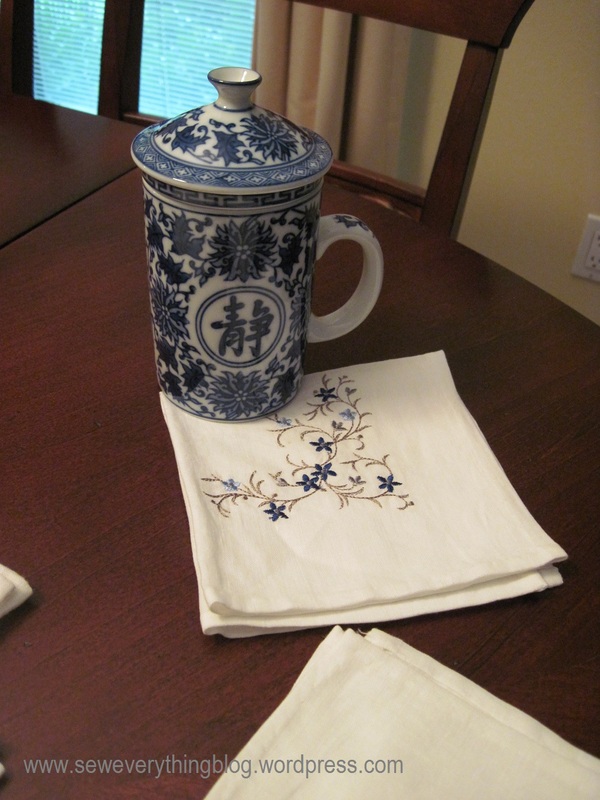 Daily life has become more informal, so using a cloth napkin has become a rarity, and some guests would be afraid of staining your good stuff. I believe that these things are to be used — pretty or not. Our daily dinner napkins are just cotton squares. Once we have a load of table linens, I throw them in the laundry like any other load. 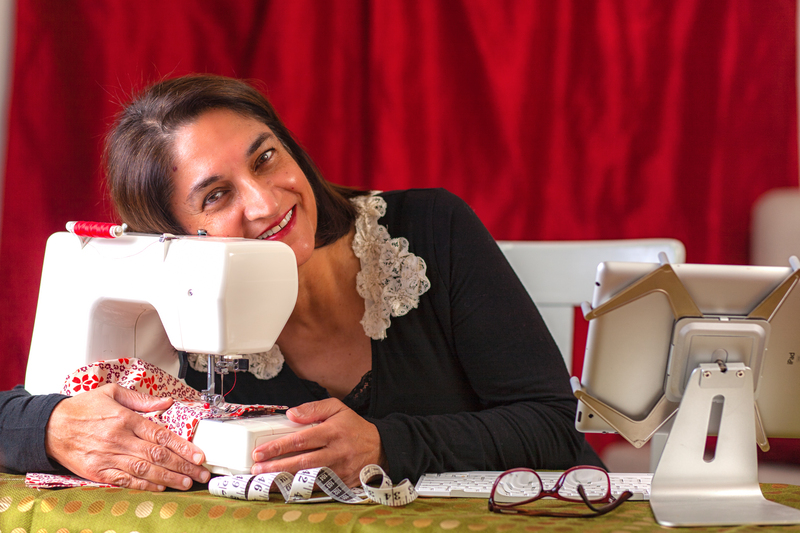 Let’s use our pretty stuff……..
Samina, after trying to get in touch with you through this blog,I want to thank you for the tutorial of the kurta, it has been of great help to me, so simple and clear, I would like to send you a picture ! I love the way your napkins turned out. Your hemming is impeccable and the designs are lovely. I am also a fan of cloth napkins. I’m sure we’re in the minority in our disposable culture. 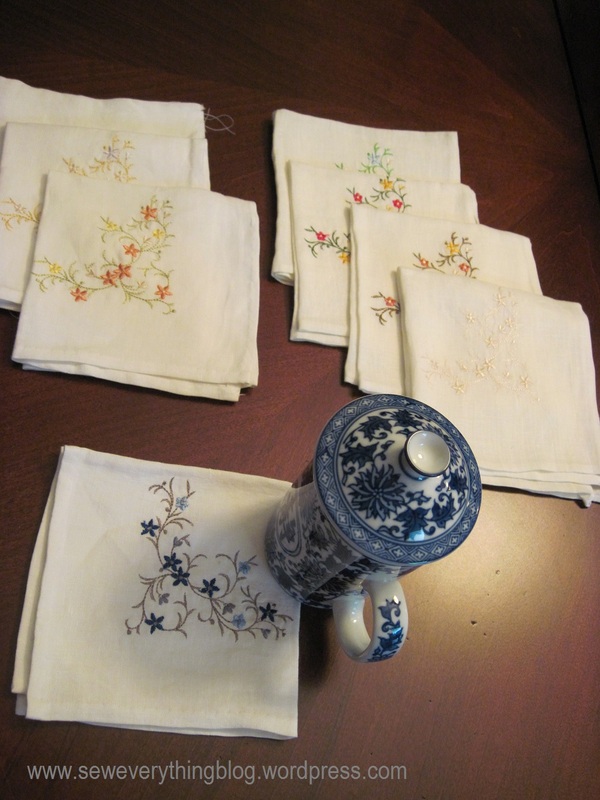 Although I favor printed fabrics and bright colors for my table settings (they go well with my plain dishes) I may have to make some tea napkins myself! Thanks for posting this.